Despite local divisions, the organizers of Saturday's third annual Womxn's March believe this year's programming is more inclusive and collaborative than past marches. Two years ago, more than 100,000 people joined the Womxn’s March in Seattle. The election of President Donald Trump compelled many women who had never protested before to take to the streets in the largest political march recorded in the city’s history. This weekend, the march is back — but some things are different. Nationally, the movement that sparked them has fragmented around questions of inclusivity and whether organizers of an umbrella group that claims to represent all women can also align themselves with a controversial figure who has made anti-Semitic statements. 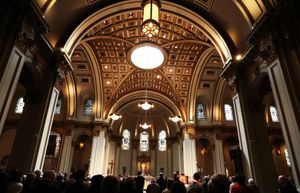 In Seattle, where organizers act independently of the national organization, there’s a different kind of split: A local chapter of the national movement is holding a march Saturday. On Sunday, another group has planned a different march because they believe it to be more inclusive. Only the organizers of the Saturday march have worked with the city to receive a permit. The third annual women’s march falls on the weekend of Martin Luther King Jr. Day. Local organizers connected with the national movement are holding a march on Saturday and other events, including panels and a day of action, throughout the weekend. Seattle Womxn Marching Forward (the group spells women that way to be more inclusive) also partnered with Seattle’s MLK Jr. Organizing Coalition, which is hosting events on Monday. Organizers of the Saturday march said they feel “disheartened” by the parallel Sunday event. Despite that division, they said their events this year will emphasize inclusivity and collaboration above all, staying above the national fray. How did this weekend’s multiple events come to be? Some national leaders have faced criticism for associating with Nation of Islam leader Louis Farrakhan, who has been called anti-Semitic for statements he’s made about “powerful Jews” who he called responsible for “filth and degenerate behavior that Hollywood is putting out turning men into women and women into men.” In response, some Jewish women are second-guessing their association with the movement. Competing marches have been planned in New York, and the Washington state organizing group dissolved. For local Be The Change Network organizers Ali Lee and Nikkia Glover, this was a wake-up call that the movement needed to be more welcoming to Jewish women. In response, they planned the Sunday march, which they’re calling Women’s March 3.0. Some organizers with the group were involved in the first march in Seattle; and the group planned last year’s march after Seattle Womxn Marching Forward decided to host a day of action instead. The group planned their march on Sunday so Jewish people who observe Shabbat, which is on Saturday, and working women who may not have Saturdays off can attend, Lee said. On Shabbat, the Hebrew word for sabbath, people who observe Jewish law don’t use electricity or public transit. Organizers with Seattle Womxn Marching Forward said they tried to collaborate with Be The Change Network and feel the parallel Sunday event will “detract from months of organizing” for their events. While some Jewish people observe Shabbat, many who identify as Jewish do not. Seattle Womxn Marching Forward communications chair Liz Hunter-Keller said she disagrees that the separate march was necessary to include Jewish people. 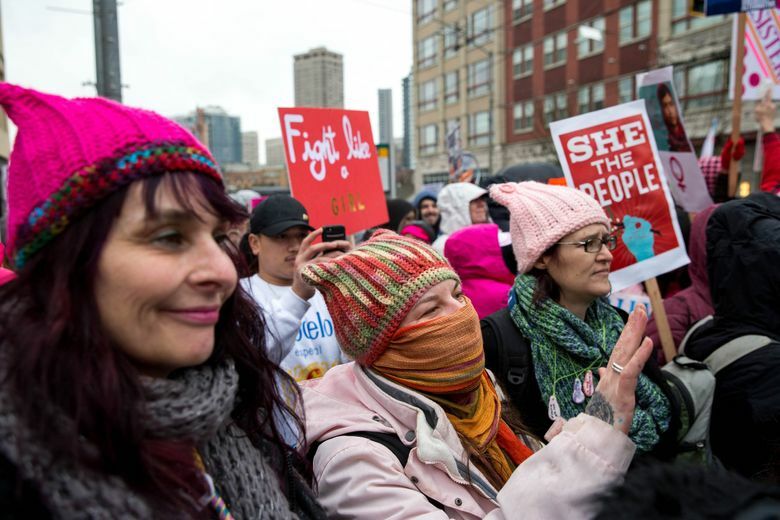 Three of the Seattle Womxn Marching Forward organizers are Jewish, and the group has sought the input of Jewish community members, none of whom were opposed to the Saturday march, she said. Seattle Womxn Marching Forward posted a statement on their website that condemned “anti-Semitic and transphobic statements” from Farrakhan. 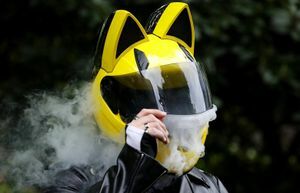 The group is not legally or financially tied to the national movement, Hunter-Keller said, though it is an official chapter. Hunter-Keller insisted that this year’s splinters don’t represent a division in Seattle’s women’s march movement — because she said the competing group isn’t a part of that movement to begin with. Hunter-Keller said organizers recognized critiques that the movement has been too focused on white women nationally — so the group made sure a diverse group of activists led programming. On Saturday, indigenous women will lead the march. Subsequent panels will cover such topics as disability justice, indigenous healing, immigrant and refugee stories, women of color in office, the #MeToo movement, youth activism, homelessness and transgender awareness. The women’s march organizers will also join a march on Monday led by the MLK Jr. Organizing Coalition, which has organized events for 37 years. The two groups worked closely in planning their events. Monserrat Padilla, coordinator with the Washington Immigrant Solidarity Network and one of the masters of ceremony for the Womxn’s March, said she didn’t march the first two years because she felt it was a predominantly white women’s movement. This year, though, Padilla decided to participate. She said she had seen white allies do important work around immigration and supporting women of color. And, she said, the diversity among the team planning the weekend’s events helped ease the pain she felt the first two years. 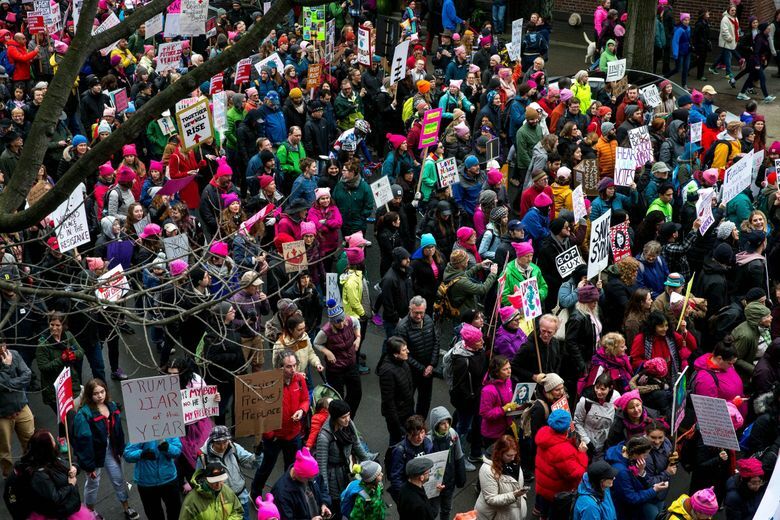 Seattle Womxn Marching Forward is expecting up to 30,000 attendees at this weekend’s events, though only 5,000 had indicated interest on Facebook as of Thursday. The group has raised its minimum and had about $21,000 in donations as of Thursday, but hoped to reach $50,000 to pay expenses for panel leaders and speakers and expand ASL interpretation. Around 2,000 people said they were going to or interested in Be The Change Network’s march on Facebook. Around 1,750 said the same for Seattle Women’s Missing and Murdered Indigenous Women March, which was originally planned in conjunction with Be The Change Network, but split due to disagreements. Be The Change Network announced it was moving the location of its march on Friday. 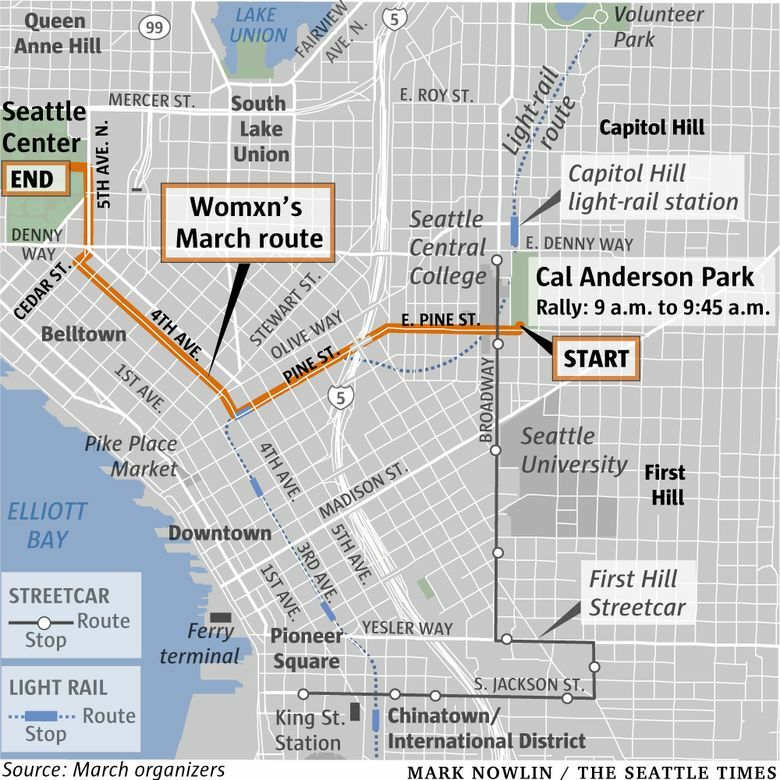 Seattle Womxn Marching Forward rally at Cal Anderson Park, 9 a.m.
Womxn’s March to Seattle Center, 9:45 a.m. Panels at Seattle Center, 11:30 a.m. Panels and accessibility information on organizers’ website. Be The Change Network Women’s March 3.0 at Westlake Park (the location was changed from Occidental Square), 10 a.m.
Seattle Women’s Missing and Murdered Indigenous Women March at Occidental Square, 10 a.m.
Information on day of action events on organizers’ website. Opportunity Fair at Garfield High School, 8:30-11:30 a.m.
Workshops at Garfield, 9:30-10:50 a.m.
Rally in Garfield gymnasium, 11 a.m.-12:30 p.m.
March to downtown, 12:30-1:30 p.m.
Rally at 4th Avenue and Pine Street, 1:30-2:45 p.m.
Community meal at Garfield, estimated 2:30-3:30 p.m. Speakers, workshops and route information on organizers’ website.